Like the birds and the flowers, I am waiting for warm sunny days. It should come soon enough as time can only move forward. The birds have return around my neighborhood. I saw cardinals and blue-jay flying around and making a ruckus with their noises. This pair of cardinals have been playing "catch me if you can" all morning. I am not sure if they are a couple, but the chase was on between them and me. I stood right underneath the male cardinal, and didn't want to get poop on my head, so away I went fast! You should be considered as very lucky if you get poop on your head. Looks so lovely - like spring. Beautiful flowers and a good one of the cardinal too. Sounds like it's almost Spring! Lovely pictures Icy. A good combination of the red and the white. Our weather has changed completely this week and is beautiful and warm. Exquisite captures for the day -- for any day, actually!! Love the colors and flowers at this time of year never fail to lighten my heart!! Thank you for sharing the beauty!! Beautiful series… the birds are romancing one another here too, they don't seem to mind the snow covered ground, they have plenty of bare branches to flirt in. 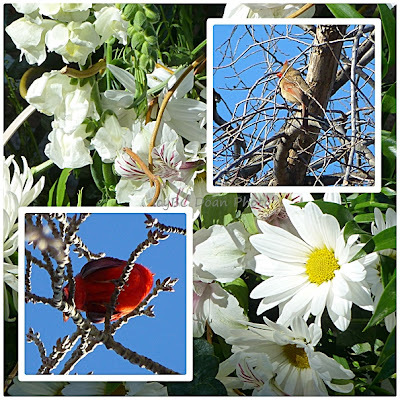 Pretty flowers and cardinals! A lovely mosaic. Have a happy week! my car always find the best spot for birds to poop. hope you have spring weather soon. oh look at them, so charming and so beautiful, sure to warm up your cold day. Such nice photos, Icy. It's been pretty warm weather here in the Sacramento area where I am still on grandma duty, planning on returning to India in a few months. Colorful collages, they brighten my day. Stunning shots, Icy and that mosaic is gorgeous. Very pretty pics. I am craving spring but not poop on my head. I had that happen to me once while I was on lunch break from my job in NY.